Injustice! One of the more bone-headed moves within the scene of U.S. film criticism this year was Manhattan alternative weekly, New York Press‘ inexplicable firing of movie critic Godfrey Cheshire, to my mind the most intelligent and interesting writer in his field. That whole brouhaha is fodder for a separate article. Here, we pay respect to the gentleman himself. Born June 3, 1951, Godfrey’s interest in movies took hold very early on and developed quickly throughout his youth. In 1978, after a jaunt around Europe, he parlayed his interests into a broad arts criticism career, which he practiced at the Raleigh, North Carolina alternative weekly The Spectator. 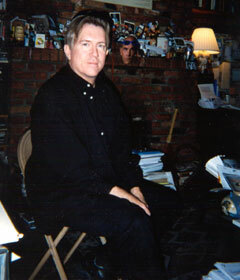 In 1991, Godfrey moved to New York City, focusing on movies within the pages of New York Press. The most prominent of his passions was, and still is, the Iranian cinema, a book about which he is currently writing. Most recently, he has written and talked about the impending switch from film to digital technology in his articles “The Death of Film” and “The Decay of Cinema”. I interviewed Godfrey recently, in his movie-memorabilia cluttered Manhattan apartment, about his passions, his past, present, and future exploits, and all the cinematic stuff in between. Keith Uhlich: How did you first get interested in movies and criticism? Godfrey Cheshire: I was interested in movies from the time I was a little kid. When I was 8 years old, I started a scrapbook in which I put newspaper [clippings] about movies. So I was [also] into what was written about movies even at that age. I wrote my first film review in prep school when I was sixteen and I went on from there. I was out of college when I made the decision that I wanted to [be a critic]. KU: What is your first movie memory? GC: The first thing I remember was being very frightened by Darby O’Gill and the Little People (Robert Stevenson, 1959). I don’t know if that trauma had anything to do with my lasting fascination with movies. [After that] my first significant memory was [at] age 11. I saw John Ford’s The Man Who Shot Liberty Valance (1962). That was the film that [made me realize] the director had something to do with movies. I made a vow to go see John Ford’s next movie. This was before there was auteur theory, at least in my awareness, [but] I was very much attuned to that angle of looking [at] cinema. KU: Did you have a lot of people who shared your interests? GC: I was pretty much alone. I had friends who were movie fans but, when we talked about [movies] and acted out scenes from The Man Who Shot Liberty Valance, I realized my friends were all interested in John Wayne. They went to that movie because it was a John Wayne movie whereas I was interested in it because it was a John Ford movie. So I felt like there was that difference between my friends and I. I think the film that really inspired me to start writing about movies, if I can credit one film, was 2001: A Space Odyssey (Stanley Kubrick, 1968) which I saw the summer before my senior year in high school. I had been getting more and more interested in movies during that time and thinking about movies as an art. When I wrote for my prep school paper I also wrote about pop music and television [in addition to movies], sort of a pop culture column. KU: You said you wrote about television. I know your feelings on television now are somewhat negative. How did that change come about? GC: I’ll point to two signposts: One was [Marshall] McLuhan and his writings in the ’60s. Those writings were very celebratory when it came to television. [According to McLuhan] television was the greatest thing, the medium that was designed to enliven and, in some ways, replace a lot of older media. It had an infinite amount of potential for expanding awareness, communication, and such. The other signpost was in the late ’70s: there was a book called Four Arguments for the Elimination of Television (1) by Jerry Mander – unfortunate name – but this is a very good book and it’s still in print. I think that if you look at the two attitudes expressed by McLuhan and by Mander you see that there was a real change in the perception of television[‘s nature], what its possibilities were in terms of influencing the culture. I think in the ’60s there was so much openness to all sorts of new media and new forms that television, like other forms, was taken as something [whose] effects were all positive. By the late ’70s, people had seen a lot of negative effects associated with television and that positive appraisal was withdrawn and replaced by a much more negative and critical appraisal. I feel that I still have both of those strains in me. I’m still open to the possibility of television being a medium that has capacities well beyond the cinema. It definitely is a more advanced medium in some ways. But on the other side of the coin I do accept a lot of Mander’s arguments about the effects of television being basically negative. I do think that television, in a lot of ways, is counter-art because art depends very much on individual point-of-view. I think movies, like books, encourage the artist/individual viewpoint. They encourage the individual viewer to view the thing as a personal dream. Television is much more communal in every way and I think that, whatever might be said for that, the things to be said against it include its un-amenability to individual viewpoints, both in terms of the artist and in terms of the viewer. KU: Whom else do you count among your influences? GC: The big influence was Andrew Sarris because I started reading The Village Voice when I was in high school and I read it religiously when I was in college and beyond. I also read his book, The American Cinema (2). That has remained a key text. I think that Sarris really was the most important American film critic ever. He was the most important in terms of his impact on me. When I say that, what I mean particularly is the overview and the point-of-view he provided regarding film history and the importance of directors. On the other hand, I think that in some ways his “auteur theory” has been misconstrued. [A] very [popular yet] diluted idea of what this means is something like “the celebration of the director.” I think that’s not really true. It’s really a matter of using the director to look at films in various ways, including themes and genres. I really think that Andrew Sarris gave people [the permission] to take cruddy genres seriously. [This] was a lot more important than saying, “you can appreciate the director.” He said you could appreciate directors who worked in gangster films, war films, westerns, etc. That really was the big revolution and I don’t think a lot of people realize that. Up until that point, people who took film seriously, as he himself pointed out, did it from a kind of literary standpoint. They might give credit to the director, but the director had to be working in high and noble subject matter. He was the one that really said one could consider John Ford or Alfred Hitchcock to be the greatest film artist even though they’re working in genres that everybody else, up until that time, would sneer at. KU: After prep school you went to Europe, right? GC: I spent some time wandering around Europe. That was for fun and for my own self-education. I do regard myself as much more self-educated than educated by anyone else. Part of that was movie oriented. I spent time going to the National Film Theater in London and the Cinémathèque in Paris, trying to figure out a little bit about movie cultures in various places. KU: After Europe you started work for The Spectator. GC: My first job as a critic was writing for The Spectator in [Raleigh,] North Carolina in 1978. I was also arts editor. KU: Was your time at The Spectator fulfilling? GC: It was really great. It was funny because I did so many things at the paper. I was there from the time it started [with] about five or six [people]. I was involved in a lot of things. I was very involved in the pop music scene – R.E.M. and all these people coming along at that time. I devoted about three-quarters of my time to that. Film criticism was the very last thing of the forty or fifty tasks I did every week. It still was very fulfilling and I’m very proud of a lot of that writing when I look back at it now. I did it in such a whirl back then. I wasn’t really that conscious of what I was doing. [Also,] when The Spectator started, there had never been a successful art-house in that area. Several had come along but they’d all gone out of business. From the time we started up I wrote a lot about art films, much more than anybody had ever done in that area. [And] a theater that was starting at the [same] time became a success and has remained in business. Now there may be a dozen screens devoted to art films. People there have said that my writing in The Spectator had everything to do with that change of climate. I think that that’s probably true and I’m very pleased with that. KU: How long were you at The Spectator? GC: [I started] in1978. Then I moved to New York in 1991, but I continued to write for The Spectator until 1998. At that time the paper was sold and I moved over and started writing for The Independent Weekly. I still write for them. KU: What was the allure of New York at the time? GC: I was really happy doing what I was doing at The Spectator. Then, toward the end of the ’80s, I began to feel like I’d exhausted a lot of the things that had been there. There were certain things that changed and were no longer as lively. So I decided I needed a new set of horizons and that New York was the logical place. At that point I decided [I would] focus on being a film critic. KU: Why focus on film then? GC: That seemed to be the logical thing. If you come to New York you need to come and say, “This is what I can do,” rather than, “I can do a little bit of all of this.” You’re looking to establish some sort of identity and to concentrate on the thing that is your strong suit. KU: Did you come here knowing you had a job at New York Press? GC: Oh no. I got on the train with as much as I could carry in my knapsack and a suitcase. I had an apartment sublet from a friend. I sent out material to New York Press very early on because three friends in one week suggested it and I was aware of the paper already. I did and then New York Press called up and [hired me]. I was very lucky in that respect. KU: I was quite impressed with the trio of you, Armond White and Matt Zoller Seitz. It was a very distinct grouping. GC: I was really proud of that. I liked the way the three voices went together. KU: How would you define your voice in that trio? GC: I think that we all had our very distinct points of view. I think Matt is probably a lot more open to different kinds of films whereas I think I’m very picky in terms of the things that I like. Armond, I think, has his own real slant on things, which is a combination of political ideas and favorite directors and sort of a moral point-of-view that he applies. So I think that people who read the three of us know how different we are from each other. I also think that I’m open to lots of different kinds of films. I have had a very strong interest in foreign films throughout my whole career. When I was writing in The Spectator early on, the New German cinema was the big thing and I wrote a lot about that. I was really into Fassbinder and Wenders and Herzog. When I moved to New York the Chinese cinema was starting to come along. I went to China. I went to Taiwan and Hong Kong and Mainland China and got to see those scenes up close and write a fair amount about them. Then I got interested in Iran and I went to Iran as well. So those things really loomed large in the way I thought about films, as well as what I wrote about during the ’90s. KU: At New York Press, have the most satisfying pieces been those on Iranian Cinema and “The Death of Film” because it seems they’re the ones that you’re the most attuned to? GC: Those are the ones that have ended up being the most important to me for sure and I guess that in retrospect they’re the most satisfying. The Iranian film [and “The Death of Film”] pieces have been the things that have brought me the most attention. They have really occupied my energies and been most rewarding over a period of time. KU: How did your interest in Iran first start? GC: It started when the editors of Film Comment asked me to go see the first festival of post-revolutionary Iranian films at the Lincoln Center in the fall of 1992. They said to go see if it’s worth an article. I had no idea that it would be worth anything, but I was really stunned at how many good films I saw. I wrote the article for Film Comment and then I continued to see as many Iranian films as I could in festivals or wherever I could see them. My interest progressed from there. KU: How many trips have you made to Iran? GC: I’ve made four trips since 1997. I went to their film festival twice in 1997 and 1998. I spent the summer of 1997 there and then I went back last fall. I’ve spent a total of about five months there in those four trips. KU: Do you feel Iranian cinema is one of the more important ones in the world? GC: I would say it’s the most important national cinema artistically outside of Hollywood. It’s sort of the definition of foreign film at this point in terms of having a real concentrated area of activity and a real distinct cinematic perspective. KU: What specifically attracts you to it? GC: I think it’s a combination of things, but I think that all of those things add up to a very distinctive sensibility. It’s like with Italian Neorealism, the French New Wave, New German cinema which were the most important ones to me before the Iranian cinema. All of these things had very important individual directors, thematic issues, and stylistic things that they did. But they all added up to a sort of sensibility. I think that Iran has that as well. I think one of the key things to the sensibility is the fact that this is a post-revolutionary situation. Although Iran did have a very active and interesting film scene before the revolution, after the revolution there was an explosion of creative self-examination and self-expression on the part of the whole culture and I think that this is really the key to the vitality of their cinema. There’s a certain idealism associated with it that I think people find attractive now because there’s so little idealism in culture in general, [especially] in cinema. There’s also a simplicity and innocence. These are all positive things that you don’t find much in our way over-technology driven culture at this point. I think these are the things that make it really seem distinctive and interesting to people. KU: What is the awareness, on Iran’s part, of Hollywood and its influence? GC: I think there’s always been an awareness of Hollywood and Western cinema on the part of Iranian filmmakers. Also there’s an idea of becoming successful via international situations, which has made Iranians sort of make films for Western film festivals. This is not to say they make films that are like Western films; it’s that they make films that Westerners think are like Iranian films, foreign in the way that Westerners want to see them. In some ways the reason that there are these films about cute, ragamuffin children and these crumbling buildings, which you don’t actually see if you go to Tehran, is that this is what the West wants to see. They want to imagine Iran as this backward, picturesque, third world, underdeveloped place. Iranians think that some of their directors create this false image of that and sell it to the West because that’s what the West wants to see. There is an element of truth to that, but that’s not all the Iranian cinema is. They have an entire cinema there. They make close to 70 films a year. We see maybe four or five of those. Those four or five are the ones that have been made mostly for Western audiences and conform to a general art film type, made in Iran and made for export in a lot of cases. What we don’t see is the big commercial cinema there that includes things made just for commercial purposes. There is a big commercial sector, which we don’t see in the West, because they’re just trashy films from that part of the world, and then there is an artistic sector on top of that. The difference of that artistic sector [is that] some [of those films] are very definitely made for audiences in other parts of the world. KU: Would you say that Majid Majidi’s films (Children of Heaven , The Color of Paradise ) are like that? GC: The Majidi films are really interesting. I think Majidi is unfortunately looked down upon by a lot of critics because his films are more commercial. But I think what he has done is very interesting in that he is not making commercial films just for an Iranian audience. He is making commercial films that really are for international audiences and work in Iran as well. He’s the only one that has done that entirely successfully. That’s his own special thing. KU: Now we come to the Iranian cinema book that you’re working on. Could you tell us what inspired it and what it’s going to be about? GC: I was approached about writing a book a few years ago. I have a contract with Faber and Faber in London. The book is going to be about the New Iranian cinema, as I call it, which is the Iranian artistic cinema. It’s going to be about that from a number of perspectives: historical, thematic, auteurist, etc. It’s basically going to be an introduction and an overview of the whole phenomenon for the Western reader. KU: What would you like a reader to take away from it? GC: I hope a basic understanding of what the high points, the most significant factors, of [Iranian cinema] are. I’m also going to talk about Iranian culture and how, unfortunately, the West knows very little about this. It shows you the limitations of our cultural viewpoint that we don’t know there’s this whole amazing civilization out there with this amazing cinema that comes out of a deep [poetic and philosophical] culture. I hope that I’ll create some awareness of that, as well as telling people specifically about the way their cinema is developed. KU: Tell us where “The Death of Film” subject came from. GC: It came from two things. One was hearing [and talking with] Roger Ebert about the subject of digital technology at the 1999 Cannes Film Festival. He brought up some ideas that he got from Jerry Mander and Four Arguments For The Elimination of Television about the physiological response to TV and to digital images as opposed to filmed images. I thought that it was interesting that he was bringing it up and talking about it, and some of the individual ideas he had were interesting as well. Then, after I returned from Cannes in 1999, there were articles in the newspaper about films being projected digitally in New York and New Jersey, which they did with Tarzan (Chris Buck, Kevin Lima, 1999), An Ideal Husband (Oliver Parker, 1999), and the latest Star Wars (George Lucas, 1999). It all sort of came upon me in a wave. The first article began with this wave metaphor, standing on the beach and this giant wave is overhead. That actually [came to mind] when I was at the beach in North Carolina and I was thinking about all this stuff. The thing that struck me was something that [neither] Roger Ebert [nor these articles] had mentioned: once you put this system in place so that you project movies digitally rather than on film, and especially if you have a delivery by satellite transmission, then basically you turn a movie facility into a TV facility. Then you give that facility a vastly expanded and different set of capacities than any movie theater ever had. From that I got to the idea that of course these capacities are going to be used. They’re going to totally transform what people think of as movies and therefore we are in for a vast transformation of this medium in the near future. KU: That leads to “The Decay of Cinema”, the second part of the article. GC: In “The Decay of Cinema”, the idea is that cinema, film as an art, reached its peak circa 1960 to 1975 because of a lot of different social and technological conditions. The idea began to decay with the real significant landmarks of Jaws and Star Wars [which, in many ways,] reoriented cinema towards television. The decay has progressed since then and I think that this technological change that we’re facing with the conversion of movie theaters to these new kinds of facilities will rapidly hasten that decay. Audio-visual movies as an art will continue, as will the idea of the auteur somewhat, but I think that the more the medium transforms away from what it was thirty-five years ago, the more these ideas will be diluted. KU: What are your feelings about this seemingly inevitable change? GC: I’m not primarily sad because I think everything changes and I’m, if anything, ambivalent about it. I’m fascinated with the transformation. I think it’s going to be an interesting process, but I do think that certain key things are lost. It’s kind of worrisome that those things, which were very valuable to the way the culture maintained itself, are being lost. So I have mixed emotions about the whole thing for sure. KU: Is one of the major fears that people will lose their sense of film history or history in general? GC: I think history in general – people are definitely losing that in part of all of this and I think that film history will be lost somewhat too. That’s not going to totally happen because all that history is much more available then it ever was. If you were a film buff before videotapes came along you used to have to go to a New York revival house or you had be a part of your college film society and rent these battered old 16mm prints. Now all that stuff is instantly available. But I don’t know if that easy availability of everything really encourages knowledge of what’s there. It’s just available. I think that, increasingly, a lot of people don’t have a sense of film history – where things came from and how they’re being developed. Especially in terms of foreign films. It’s interesting because foreign films, in what I call the peak of cinema, 1960-1975, loomed larger than Hollywood in any cinephile’s mental framework. Now people that are aware of movies are very seldom aware of foreign movies, especially the history of foreign movies. People don’t know Antonioni and Godard and even further back than that. They just don’t know them. One thing I think is very unfortunate, but indicative, is cable television. Where are the foreign films? There are [so few] foreign films on the 800 channels. Foreign films are just off the radar in terms of the distribution of film culture via television. KU: What advice would you give to someone to weather the changes? GC: Read a lot. I think that so much of film culture is based on literary culture. A good way of learning about film culture is to read about it. Read Andrew Sarris, or whatever critics you particularly like. Try to form a sense of history. I think that that’s really the first thing that has to come for any young cinephile: to sit down and try to get your own idea of how film history fits together. The important thing is not necessarily to be completely accurate, because I don’t think that there is any sort of ideal overview of what all this stuff is and what it means. I think the main thing is for you to have your own grasp, for you to figure out your own map of things. But by all means look at the maps that are provided by the people that have really studied this, talked about it, and written about it. I think that’s really key: for people to try to understand history on their own, and educate themselves about history, before presuming to be able to say too much about the present. KU: What are your feelings towards movie criticism today? GC: Here again I must say I’m ambivalent. On the positive side, I really respect a lot of my colleagues. I think a lot of film critics are very dedicated to their chosen field or subject. They generally try to do very good work, are pretty conscientious about stuff, and try to uphold standards of quality and intelligence. [However,] I think the culture is overwhelmingly against them in a lot of ways. I think that the conditions in which people write have eroded a lot faster than public consciousness has. What I’m saying here is that publishers, more and more, want to give readers bite-sized, innocuous information about film rather than any kind of critical point-of-view. I think that publishers justify this by saying that the public doesn’t want a critical point-of-view, they only want little nuggets of information, whereas I think that that’s a self-fulfilling prophecy. I think that there is a bigger audience out there, much more interested than publishers presume. So I would tend to blame publishers more than I would a decline in audience intelligence and interest in film. But the conditions are getting worse and worse. There are fewer places for critics to write where real criticism is called for and there’s, more and more, a kind of unquestioned assumption of collusion between all these various media. The publishers assume that audiences want to be flattered rather than having a critic with an independent and critical viewpoint [critique a Julia Roberts movie]. In the context of the way it operates it’s very corrupt because the publishers are too conscious of getting money from the studios for advertising. They’re just assuming that their audience only wants to be connected to some commercial experience rather than having an intelligent perspective offered to them. The heyday for American film criticism was the ’70s because I think the people that got into it at that point were really inspired by the likes of Andrew Sarris and Pauline Kael, both of whom became famous and established the importance of film critics as a cultural force. At that point in the ’70s I think you had your ideal audience, schooled on lots of different kinds of films from Bergman and Fellini to James Bond. These people also read the Pauline Kael’s and the Andrew Sarris’s and publishers would publish very long pieces of thoughtful film criticism all over the place. It’s been declining since then. Now the problem is that there are very few places that will publish that kind of thing. And, as I say again, I think it’s not that audiences and readers are not interested. I think that there is a literate audience out there ready for both intelligent writing and intelligent writing about film. Most publications assume that not to be the case. They assume that they have very busy people who just want some connection to some other cultural source of immediate gratification. KU: How do you see your writing in relation to the person reading it? GC: One very basic thing is that I don’t want to tell the person too much. I don’t want to presume that people have seen the movie before they read my review. In the optimal situation, I would rather discuss a film that a reader’s seen rather than try to discuss it and not give away things. Nonetheless I try to be conscientious about not telling people too much, and discussing the film rather than the plot. I think that you have a pretty low level of film criticism that basically is just rehashing the plot. Any film critic who’s any good likes to get away from that very quickly. KU: In the future, do you see yourself continuing with movies? GC: I don’t really know. I wish I had a more concrete, definite, positive, upbeat answer to give. I’m not sure what is coming next. The one thing I can say definitely is that I’m in a real period of transition right now, in my professional life and perhaps other ways as well. There is an “other” side to this transition. I’m not sure what’s on the other side of that barrier. I would imagine that I’ll still be involved in writing and/or film in some capacity, but I’m not sure what that will be. I do think that my chances of remaining in film criticism are somewhat up in the air at best because of the scarcity of places to write the kind of film criticism I like. Keith Uhlich is a writer based in New York. A member of the Online Film Critics Society, you can read him at www.culturedose.net and www.slantmagazine.com. His e-mail is [email protected].